On February 22, 2011, Killzone 3 will storm store shelves in more ways than one. 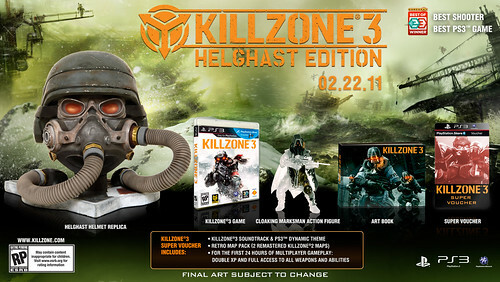 Killzone 3 will be available in a limited Helghast Edition as well as the standard edition. The Killzone 3 Helghast Edition ($129.99) is a must-have for the fans. This one-of-a-kind set features a collectible replica of a Helghast Helmet containing an art book, Super Voucher (see below for contents) and the Killzone 3 game with bonus content. Also included is an exclusive Cloaking Helghast Marksman action figure created by DC Unlimited, that will not be sold anywhere else. Download packs are also available separately if you’d rather pre-order the standard edition Killzone 3 at one of the proceeding retailers. Killzone 3 will be available in North America on February 22, 2011 for $59.99 and the Helghast Edition will be available on the same date for $129.99. Pre-order today! incredible gonna get myself a Helghast edition. wow, I could never justify spending that much money! But that sweet helmet makes it so tempting. Will there be a mid-tier option for people that want the Super Voucher + game? No, the only way to get that great bonus is to pick up the Helghast Edition! YES! I was literally thinking about an hour ago about how I wanted to preorder KZ3 but I needed to wait for a collector’s edition, this is an absolute must have for me! Great extras, this is an incredible collector’s edition! This will be the king of all shooters! Definite buy for me. Killzone is by far my favorite franchise and I’ll be more than happy to shell out $130 for this. Great deal. Good stuff, I think i will go with amazon. Really enjoying the beta. Is that the first 24 hours after the game is released (1 day only), or the first 24 hours the player spends in multiplayer (possibly over the course of several days/weeks)? The first 24 hours of the multiplayer enhancements begins once the voucher is redeemed. CAN’T WAIT! Totally getting this! FormerPsfan, do you even own a PS3? All you EVER do is come here and whine like a child who is on timeout, every single day. Are you entertaining yourself? Because its a really pathetic display. Dont you have any obligations in your life? I will be pre-ordering from Amazon. I pretty much do all of my game shopping there. Fortunately in this case it also happens to have the pre-order bonus that I find most appealing. The replica of a Helghast Helmet, how big is the model? Just ignore the troll. Responding to him/her only make things worst. The Helghast Helmet is 238mm tall. The Helghast insignia base is 300mm wide and 296.5mm deep. Off topic question, Has the PS Rewards Emails gone out yet? Also the opt in for marketing, there are two options one just for SCEA and the other for 3rd party people. Do you have to have both or just the Sony one checked? As soon as Amazon lists the Helghast Edition I will pre order the game. Also please makes sure Radec Academy doesn’t find it’s way into the Retro Pack. I want Salamun Market and Beach Head. So pricy, but so neat… I’m conflicted. Also, finally a dynamic theme for Killzone 3. Now there should be some avatars released for Killzone 3 as well. helghast edition or 3d tv? its my b day on the feb 28 sooo mabey killzone 3 and 3d tv! but cant get helghast edition :( too expensive. Awesome! Will get this if it will sell in England!!! OH quesyion please answer this, it going to very hard to find answer for this only you guys no please! if i pre-order from Gamestop will i get the dynamic theme also? I NEED that! well…maybe I don’t “need” it but I definitely want it! Being a huge Killzone fan this would go great on me desk…or tv….or anywhere in my house…. I still wish I would have been able to get one of those STA-52 replicas! Very nice! Makes me even more excited for this game. Can I wear the mask? If so this is a MUST! Haha, no you can’t wear the mask. But it’d make for a great decorative piece among your video game collection! Playstation 3 Halo Cat Helmet Edition. Retro pack idea is awesome! Please tell me one of the two maps is Pyrus Rise (spelling?) I could never spell it but is in my top 5 favorite maps of all time for any game! When will you reveal what two maps come in this pack? Do the fans decide or something? The Helgast edition will be sold in Mexico? Sorry about that i was freaking out… $129.99 not bad for what you get. But… Wait a minute… NO UNLOCK EXCLUSIVES FOR SINGLE-PLAYER CAMPAIGN?!?!? WHAT A SHAME! PLEASE BE CREATIVE BY FINDING A WAY TO DO THAT FOR US WHO LOVES SINGLE-PLAYER CAMPAIGN! PLEASE?!?!? You still have time until February! Thanx. i really want the action figure. i’ll have to think about it. what maps are gonna be in the Retro Maps? And why don’t you guys just include all the old maps from Killzone 2 anyways? More maps means people wont get sick of the game as fast. Jesus, use your heads people!